So after suffering the onslaught of awfulness that was Status Update, I immediately went into The Mercy with a sense of hope – ironic, seeing how this isn’t exactly a very hopeful story – because no matter what, this was going to be a far more soothing experience than what I had just sat through. Luckily, what I expected was exactly what I got: a strong, dramatic and very emotional movie about a man whose optimism and inspired dreaming ultimately got the better of him, with some very fine acting and solid direction that really propelled it forward. 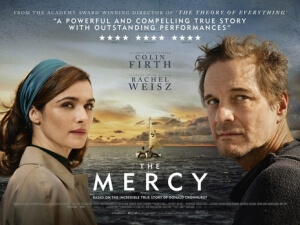 The Mercy is about Donald Crowhurst (Colin Firth), a businessman and amateur sailor who in 1968 learns of a single-handed yacht race around the world set up by The Sunday Times, with prizes set up for the first person to sail the seas and back without stopping as well as the fastest to achieve this goal. Inspired, and endlessly determined, he wrangles together investments so he can build a yacht to compete, even going so far as to hand over the deeds to his house and business to his investors should he not complete the race, and eventually he sets sails leaving his family, including his wife Clare (Rachel Weisz), behind to await news of his progress. He doesn’t have much luck getting far, though, and facing financial ruin he starts to lie about his whereabouts so he can be seen as getting much farther than he really was back home, which unbeknownst to everyone hearing the news starts to have a massive psychological effect on Crowhurst, leading to an ultimately tragic conclusion. Tragedy is at the heart of this story, as we slowly see Crowhurst’s determination to be seen as a heroic figure consume him to the point of insanity, and worst of all it starts before he even sets out on his voyage. His desperation to secure the funding so he can build his boat and have it be ready before the competition deadline is all over his face, which makes it easy for investors such as Ken Stott as a local caravan salesman to take advantage of his idle willingness to partake in such an extraordinary and almost impossible endeavour, and set conditions such as his handing over of the deeds to his home and business should he fail. The fact that he went into all of this with such fierce pressure – he will literally lose everything if he doesn’t succeed in doing what he promised to do – makes his decisions to lie and be seen as a false hero all the more heartbreaking when you know where it’s all going to end up, and Firth gives his interpretation of the man a stiff upper-lip that crumbles every time he fails to even make wind on his boat alone in the vast ocean, giving us a vastly human glimpse of a man with everything riding on his sea-faring shoulders who’s also slowly but surely going mad. Firth and director James Marsh accomplish showing the raw emotion and tragic consequences in this character’s eyes, as he is someone who knows that he’s set out on an impossible task and must do whatever it takes to keep the lie sound without ruining his or his family’s reputation. The way that the film is shot is also admirable in its vintage replication of the era it all takes place in. Marsh collaborates with cinematographer Éric Gautier to make this look and feel like this is genuine footage from the late 1960s, from the grainy and composed visuals that look as though they were taken from an old film reel, to how some of the lighting reflects off the lens and onto the characters or scenery to really give off that 60s vibe. It’s a trick I’ve seen Marsh do before in parts of the cinematography in his previous film The Theory of Everything, and that too was able to look and feel authentically of its time period as this film is; long story short, James Marsh seems to be really able to study footage of the time period he is representing and use his knowledge of it to make something that would fit right in to the types of films made back then, at least visually. Luckily, it’s also supported by some really strong performances by Firth and Weisz, the latter being a last-minute replacement for Kate Winslet but you could not tell from how well she performs here, as well as a harrowing real-life tale of hope and despair combining to make something truly tragic. The Mercy tells a tragic real-life story compellingly with graceful filmmaking and strong performances by Colin Firth and Rachel Weisz.